(i) Phase one: Application onto the Aspen data base. To apply to the conference please click here. (All, including inviting speakers must apply). (ii) Phase two (only if you received an acceptance email from us): If you received an acceptance email, you will find the relevant registration information as well as how to book a hotel etc. All participants (including invited speakers) must pay the $400 registration fee for this conference. You may pay it online by following the instructions on the registration page. 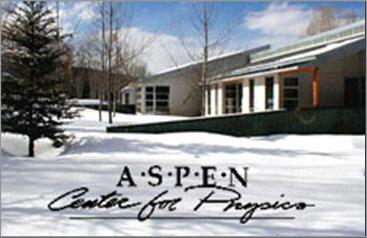 A registration reception will be held at the Aspen Center for Physics from 5:00 - 7:00pm on Sunday evening. If you want to explore the local restaurants after check-in, there are free local shuttle buses to take you to town from the Physics Center. We will also suggest a local restaurant for each night, and the hotels each have a restaurant and a bar menu if you prefer to eat there. If you arrive after 7:00 PM, you may register the following morning at the Aspen Center for Physics, where your meetings will take place. Conference dinners are at 8:00 PM on Tuesday and Thursday at the Aspen Meadows.